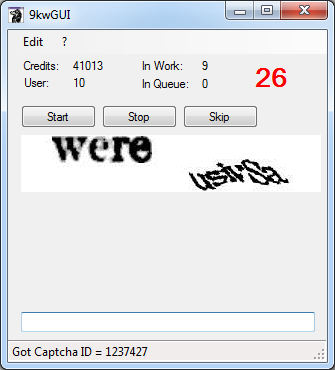 Simply enter the API key in apikey.txt and start the application captcha9kw_win.exe. Generate a new API key in the settings at 9kw.eu and enter it at the URL "http://www.9kw.eu/". Sounds have to exists as "sound.mp3", "sound.wav" or similar in the same directory. The application should show up and, after a click on "Start", look similar to the image. The application minimizes automatically to the systray and shows up automatically when there are new captchas. Exit over the systray or in the menu under File => Exit. It stops automatically when a captcha wasn't solved.